Cross and Cutlass: Book news! First of all, I'd like to express my deepest sorrow for those who lost their lives in France yesterday. My sincere prayers go up for the injured to heal in soul, body, and spirit, and for the comfort of those who lost loved ones in such a horrific act of terror. May our Father in heaven bring peace to all and turn hearts toward Him where they will find love, comfort, and rest. When I get it back from all three of these wonderful friends, I will fix everything, format it, and load it up on Amazon at a special Pre-order price. I'm still hoping for a September 1st release, unless the editing takes longer than expected. I'm going to have a discounted Pre-order price for no longer than a few weeks, so please sign up to receive my blog or my newsletter, so you don't miss out. This book is like nothing I've written before, and I know you're going to love every minute of it. Of course it's got the usual adventure, wit, and romance, but there's an extra dimension of spiritual battle threaded throughout that I hope you find intriguing. If you don't know the storyline, click on "Coming Soon" above. My publisher has drastically lowered the price on my entire Surrender to Destiny Ebook series. The first Book, Surrender the Heart, is FREE. If you haven't read it, it's one of my readers' favorites, so be sure and pick it up. Also, my publisher has lowered my novel, Veil of Pearls to 99 cents! I wrote an article on Spiritual Power you might find interesting. I'm also giving away a paperback of Charity's Cross. So click HERE to read the article and enter to win! What else has MaryLu been doing this summer? Taking care of my wonderful grandkids (one who was just born 3 weeks ago! ), studying end times and the Illuminati, hanging out with friends, enjoying the waterfall and pond my hubby made for me in the backyard, watching humming birds drink from the feeder outside my window, and going for long walks chatting with my Father. How about you? I can't wait to help with She Walks in Power. Awesome prices on your books, and yes, Surrender the Heart is one of my favorites. Your backyard sounds so inviting. Have a great weekend, my friend. Great news you have shared. Eagerly awaiting the release of "She Walks in Power". By the way .... I would love for you to show some pictures of the 'waterfall and pond' your husband made ... how neat to have that !!! Sounds wonderful, I will be looking forward to reading it. Your waterfall sounds wonderful too. Thank you so much, Ladies!! I will try and get a picture of my waterfall. Brenda.. hadn't heard about Franklin Gram's call for prayer. Man, we sure do need it. And Brooke, enjoy your son's wedding!! And the festival!! Sounds like a fun summer for you! Looking forward to reading that beautiful book - love that the subject is spiritual discernment and loved your article on Spiritual Power!! Since the heat index has been over 100 degrees here for the last few days, I'm staying inside as much as possible - always housework and online duties to fulfill, however, also lots of wonderful books to read, people to chat with, music to listen to, and movies to watch - when I get bored, lol!! My niece, nephew, and families are in town from out-of-state - a cookout and fireworks were planned for tomorrow evening so praying the weather is cooler then. As with the others commenters, I'd love to see pics of your waterfall/pond - so love them!! Any koi in the pond?? Thanks for writing such wonderful faith-filled books, MaryLu!!! Love, prayers, and hugs!! 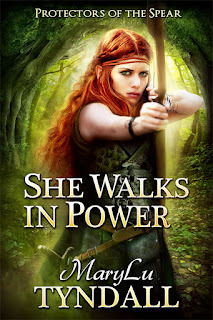 So looking forward to --"She Walks in Power." I also would love to see your waterfall. How sweet is your husband to do that for you. Is there a hidden cave or trunks full of plunder -behind your waterfall? My summer has been busy traveling to Georgia, Tennessee and back home to north of Boston. I fly out to Hershey, Pa in two weeks and then in October back to Pennslyvania and my last trip in December to Georgia to see my granddaughters perform in the NutCracker and to spend Christmas there. Boy I am a busy one aren't I???? Enjoy your postings and they challenge me to dig deeper into God's word. And that is where we should be as the times are bad and the weather is striking places that usually do not see floods, tornado's , drought etc.and the evilness of terrorists everywhere -striking here and there without giving a thought to anyone's life is downright Scarey. Praying for those I know that do not have Christ in their lives. So I appreciate your words of wisdom. Goodness I can carry on can't I? Yes, it does sound like you've had a very busy (and adventurous) summer, Elsie! Indeed, times are perilous these days aren't they? I, too, pray for many many to come to the Lord before the end. This life is merely a staging ground for eternity. Blessings to you too!! And those ????? ?should be the icon of praying hands. Sorry . So looking forward to your new book!! I get chills just thinking about it! Like you�� I have been grandsitting, they are the best days of my summer and on the days I'm not you will find me at work��. I have been a little slow reading and commenting on blogs and posts for i have just not been feeling great, but I am trying to catch up. I would love to know what you are studying for end times, for I love when you blog about it there in Cross and Cutlass. Thank you for doing your studies and sharing with us what you have learned. God bless! Thanks Faith!! I'm so sorry to hear you haven't been feeling well. :-( I know illness can really affect everything else in your life. I'm lifting up a prayer for you now.. that you regain your health and strength! Grandkids are great, aren't they? I'm glad you get to enjoy being a grandmother too! End times? I have so much I've learned! I hope to post some of it here in the future, even at the risk of causing some controversy. It's amazing how much the topic upsets people. Not sure why. But stay tuned! God Bless! Ooooh!! I'm so excited for this series! I love learning about spiritual gifts, and when that love is merged with medieval fiction...!! So much awesome!